46 companies currently qualify for inclusion, with 27 filing in U.S dollars and 19 in the Canadian currency. Since our last report in mid-March, we have added two companies that report in Canadian dollars, retailer High Tide (CSE: HITI) (OTC: HTDEF) and extraction-focused licensed producer MediPharm Labs (TSXV: LABS) (OTC: MEDIF). So far in April, six companies have reported. Trulieve (CSE: TRUL) (OTC: TCNNF) reclaimed the lead with a very strong 4th quarter, generating sales of $35.9, which was ahead of the consensus of $32.5 million and represented sequential growth of 27%. All of the company’s revenue is from its Florida operations, where it holds leading market share. The company reiterated 2019 guidance of $214 million, with expected EBITDA of $92 million. KushCo Holdings (OTC: KSHB), which was expected to generate fiscal Q2 sales of $25.5 million, grew revenue 39% from Q1 and 240% from a year ago. The company improved its guidance from $110-120 million to $140-150 million for the fiscal year ending in August. Green Thumb Industries (CSE: GTII) (OTC: GTBIF) reported Q4 sales of $20.8 million, slightly ahead of expectations, growing 21% from Q3. The company also reported pro forma sales that included acquisitions that closed after the quarter and pending acquisitions in excess of $44 million. GrowGeneration (OTC: GRWG) saw a resurgence in its same-store sales, which boosted revenue in Q4 149% over year-ago levels. The company provided 2019 guidance in excess of $52 million. Helix TCS (OTC: HLIX) reported 11% growth in Q4 sales over Q3, with revenue of $3.4 million. Halo Labs (NEO: HALO) (OTC: AGEEF) saw sales decline in Q4 from Q3 by 15% to $3.0 million. 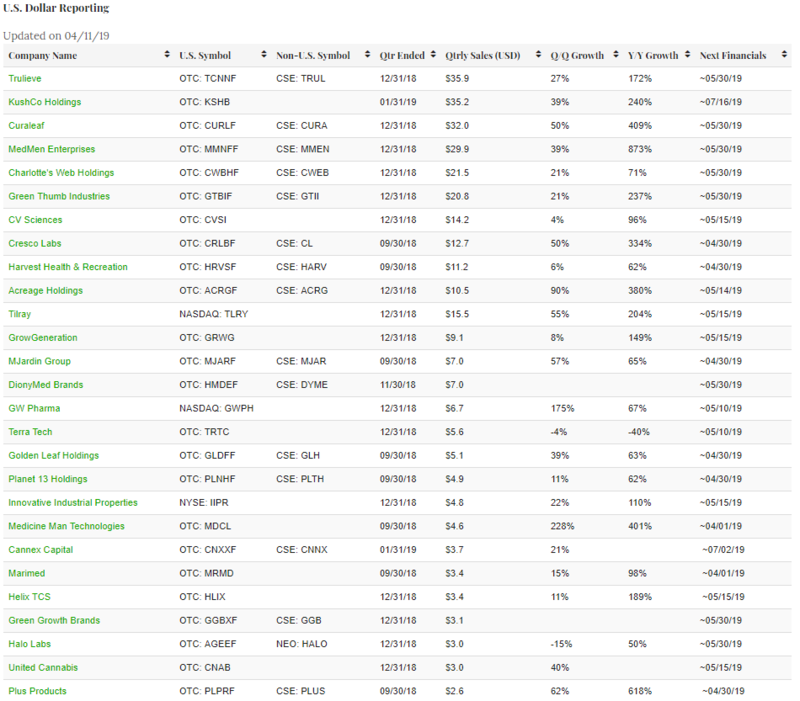 Several companies are expected to report over the balance of April, including Cannex Capital (CSE: CNNX) (OTC: CNXXF), Cresco Labs (CSE: CL) (OTC: CRLBF), Golden Leaf Holdings (CSE: GLH) (OTC: GLDFF), Harvest Health & Recreation (CSE: HARV) (OTC: HRVSF), Marimed (OTC: MRMD), Medicine Man Technologies (OTC: MDCL), MJardin Group (CSE: MJAR) (OTC: MJARF), Planet 13 Holdings (CSE: PLTH) (OTC: PLNHF), and Plus Products (CSE: PLUS) (OTC: PLPRF). Plus Products recently pre-announced Q4 sales at $3.4 million. Of the companies that report in Canadian dollars, two were newcomers to the list. MediPharm Labs debuted with sales of C$10.2 million in Q4, its first reported revenue. High Tide’s sales of C$5.0 million in its fiscal Q1, which grew 138% from the prior quarter, included cannabis retail revenue from its Canna Cabana stores in Alberta as well as a contribution from the recently acquired Grasscity. Nutritional High (CSE: EAT) (OTC: SPLIF) reported fiscal Q2 sales for the quarter ending in January of C$6.1 million, up 5% from Q1 and representing revenue from its California distribution business that it acquired last year. Gross profit improved sequentially from 19.5% to 25.0%. 1933 Industries (CSE: TGIF) (OTC: TGIFF) also reported, with its fiscal Q2 revenue declining 19% from the prior quarter to C$3.7 million. The company attributed the decline to “slower than expected sales due to challenges with yield and access to supply” in its Nevada operations, though it reported improvement subsequent to the end of the quarter since hiring a new master grower. During the rest of April, we expect reports from Aphria (TSX: APHA) (NYSE: APHA), which has scheduled a call for Monday, April 15th, Namaste Technologies (TSXV: N) (OTC: NXTTF), which is delinquent, National Access Cannabis (TSXV: META) (OTC: NACNF), which announced it will release the results on April 16th before the market opens, Organigram (TSXV: OGI) (OTC: OGRMF), which has scheduled a call for Monday, April 15th, Origin House (CSE: OH) (OTC: ORHOF) and Sunniva (CSE: SNN) (OTC:SNNVF). 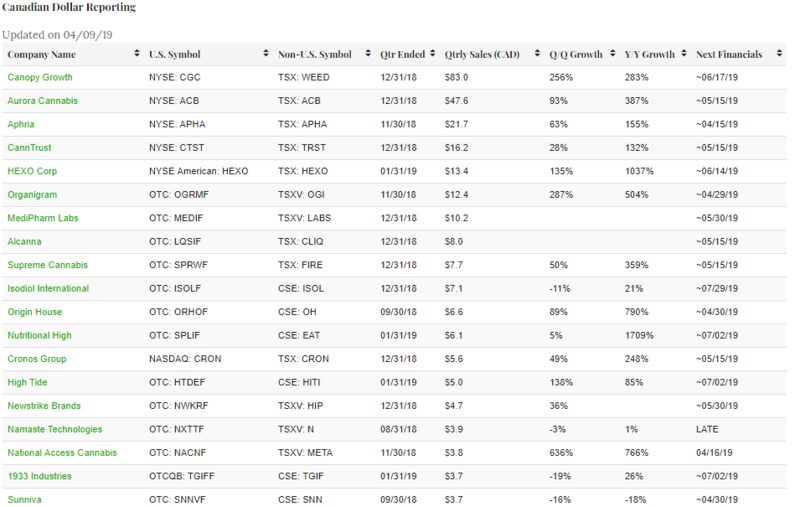 According to Sentieo, Aphria is expected to report Q3 sales of C$85.2 million, up 293% from Q2, while Organigram, which had previously indicated that it expected net revenue to be in excess of C$24.8 million, is expected by analysts to grow revenue from Q1 by 91% to C$23.8 million. Origin House is expected to have generated Q4 revenue of C$16.1 million.